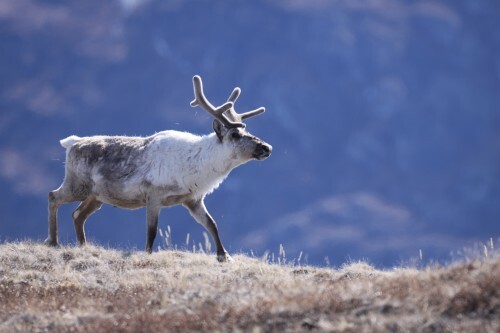 Caribou, a top herbivore in Arctic Greenland. Climate change is likely to have strong effects on top consumer species like these, and in turn, affect many more species within the natural community. Courtesy of Eric Post, Penn State University. The fate of many species is uncertain in the face of climate change. While some can adapt to changes, others cannot, and might face extinction.. Most studies that try to determine likely winners and losers use the “climate envelope” approach, which considers one species at a time and correlates its occurrence with climatic and environmental variables. Predictions using this method calculate that by 2050, 15 to 37 percent of species will face extinction . But more than just environment factors affect species. Species also interact with each other in complex ways that affect their viability. The climate envelope models miss much of this complexity. Interactions among species at one level of the food chain can cause cascading effects on other species, serving as “biotic multipliers of climate change,” according to Phoebe Zarnetske, a community ecologist and postdoctoral fellow at the Yale Climate and Energy Institute. Recent findings indicate that climate change should affect top consumers more, disrupting vertical interactions and therefore affecting species across trophic levels. In this general example, climate change reduces the populations of top predators, which increases the populations of herbivores, which then decreases the populations of plants. The community experiences an overall decrease in stability and diversity. Courtesy of Phoebe Zarnetske, Yale Climate and Energy Institute. Recent studies highlight how changes in interactions between top consumers and their resources (vertical interactions) could be disrupted by climate change. “We think that the largest changes to communities of species will occur when climate change affects the interactions involving consumption of other species,” Zarnetske says. Adding or removing top consumers leads to disproportionate changes in community compositions. These higher-level species are also more sensitive to temperature, leading to patterns of top-consumer extinctions. This can ripple through the food web and multiply extinction risks across trophic levels. Recent experiments in Arctic Greenland upheld this theory, showing decreased plant species diversity and lowered community stability when tundra vegetation was warmed and herbivores were removed. The same outcome was observed with top predators. On Isle Royale, an island in Lake Superior, declining wolf populations led to a subsequent surge in moose population and decline in balsam fir. 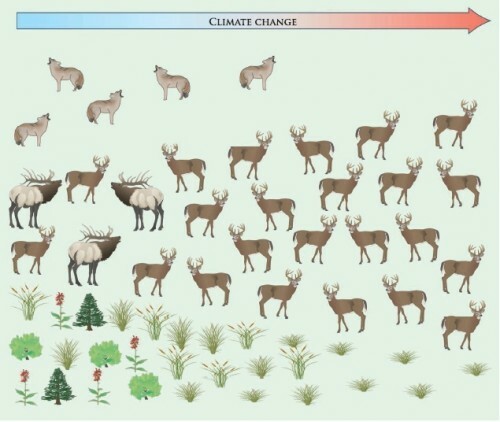 Both situations support the emerging idea that when climate change interrupts vertical interactions, a multiplier effect on species across trophic levels occurs. “It’s important to remember that every species in a system is being affected directly by climate change but also indirectly by the different species in the system,” states Zarnetske. “The theory and evidence point to the top consumers” as the most sensitive. The cases recorded so far see communities becoming generally less stable and less diverse. Melting ice from the Nabesna Glacier, Wrangall-St. Elias National Park and Preserve, Alaska, USA. 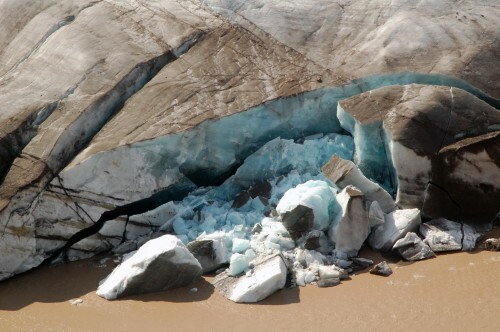 Climatic warming is having large effects on Arctic ecosystems. Courtesy of Trey Simmons, National Park Service. Models predicting the effects of climate change must consider species interactions. But identifying biotic multipliers will require large data sets to produce more accurate models. Data at the temporal and spatial scales necessary for this research are currently sparse, but attempts are being made to collect more information. The Long Term Ecological Research (LTER) Network, established in 1980, is currently collecting data on ecological changes over time. In addition, the Map of Life, an expansive project involving Yale’s Walter Jetz and other researchers, currently maps about 46,000 species around the world and are continually adding more. Ultimately, the investments needed to acquire more data on species are substantial, but the potential benefits of preserving biodiversity and stabilizing ecosystems are, as shown by recent studies, invaluable.